Your countertops may seem simple – a small, flat surface area made of a specific material – but there are actually many terms that can be used to describe their appearance, design, construction and more. It is important that you understand each of these terms so that you can learn about how to care for or repair your countertops more easily. If you don’t understand these basic terms, you’ll feel like you’re reading a foreign language when you read about your countertops. Always talk to your Arizona countertop company if you have questions about your purchase or the service for your countertops. But refer to this glossary when you are uncertain about information you are reading online or you are trying to better educate yourself about your countertops. A backsplash is a small area of tile or another material that protects the wall over your countertop and prevents water from leaking behind the countertop. A standard backsplash is 2.5 inches high, but some people make them thicker. Some even cover the whole wall between the upper cabinets and the counter with a tile backsplash. Some countertops are made with the backsplash attached, such as Corian® countertops. Corian® is a solid-surface material made by Dupont that is popular for countertops in kitchens and bathrooms. Corian® is non-porous, so it is resistant to staining and it is easy to maintain. Corian® countertop refinishing can be used to buff out scratches and other surface defects to easily renew the look of the surface. Since the material is solid, the color goes all the way through the thickness of the countertop. Finish refers to whether your countertop has a glossy shine or is matte. Both finishes are smooth to the touch, but gloss has much more shine than matte. The most common finish for Corian® is matte. An integrated countertop is a solid surface countertop that has a solid surface sink attached to it. The resulting design looks seamless, as if it is all carved from one piece of material. Since there are no seams, there are no nooks or crannies in which dirt and bacteria can get caught, which makes the countertops more sanitary and easier to clean in general. Laminate countertops have traditionally been a popular option for all types of homes because they are inexpensive and come in a variety of colors. These countertops have a very thin – only 1/32 inch – piece of synthetic material glued on top of pressed board. The material can be shaped with heat and pressure. Formica and Arborite are popular brand names of laminate countertops. A mitre is a corner where two pieces of material meet at angled cuts. Typically, a mitre cut is 45 degrees, but a mitre can be in any measure. Mitres are used where your countertop bends, such as where two sides of your wall meet at the corner or where two ends of your counters meet. Nosing refers to the treatment used to finish the edges of your countertops. Some materials can be left unfinished, and some can simply be beveled or sanded smooth. Others need a strip of wood or other material attached. Post-forming refers to heating and forming laminate around the substrate. This is the way that laminate countertops are finished. Corian® countertops are solid surface, which means that the material is the same all the way through the thickness of the countertop. If you were to cut the countertop in half, you would see that the texture, color and consistency is the same all the way through, rather than having a filler material in the middle. Solid surface counters are also non-porous, so they are more sanitary, and they are easy to maintain and repair. They come in a large variety of colors and can be made in just about any shape without seams. Corian® is just one brand of solid surface countertop, though it is the most popular. Under-mount sinks are those that are installed to adhere to the underside of the countertop, rather than having a lip that rests on the top of the counter. Under-mount sinks give homeowners more design flexibility with the countertops, and they are easier to clean. The edge of the countertop can be shaped into a different edge profile. For example, instead of the countertop and lip joining at a sharp angle, the corner can be slightly smoothed for an “eased” profile. Or it can be smoothed into a continuous shape, known as a “round over” profile. Another option is to have that corner cut at an angle for a “bevel” edge profile. The friendly professionals at AZ Countertop Repair and Refinishing are happy to explain any of these terms in more detail or to help you understand any other terms or concept you do not understand about countertops. We are the Corian® countertop repair experts in Arizona, including Corian® countertop refinishing. 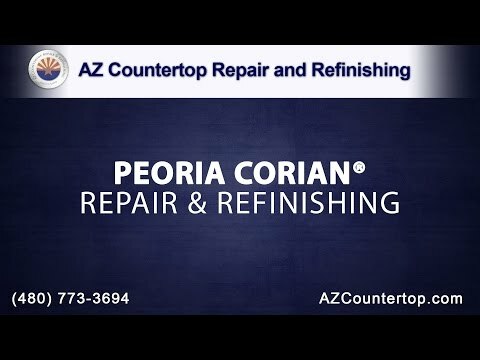 Contact us today to get an estimate on a Corian® countertop repair in Peoria or Peoria Corian® countertop refinishing project. We’ll let you know the best option for making your Corian® countertops look like new again!